different backgrounds and tones. With an acoustic groove, ShamaZ delivers everything from Reggae and Soul to flamenco, organic rock, and ballads, all with touch of South America. alternate between elements of Jazz, house, and myriad improvisations. 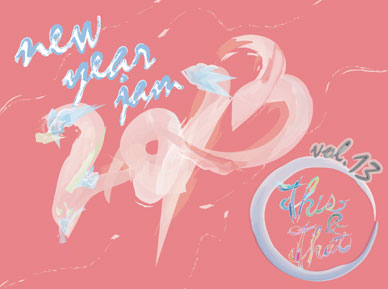 An experimental “human anthem band” based on the art of flamenco, MYRKｓ have put together a special group for the This&That New Year Jam 2013. Singer and voice trainer Yumi Nogami explores myriad vocal varieties from opera to enka. She has enjoyed success both in Japan and abroad, making several appearances on stage with various collaborators as well as on TV. For This&That Vol. 13, Yumi is joined by Tamaki Inoue on piano, Imari on bass, and Natsuko Sugano on drums. Emi Nishiyama is a graphic artist living in Nakano, Tokyo. Though she exhibited artistic talent from a very young age growing up in the public housing projects of Amagasaki, Hyogo Prefecture, the concept of being a “real artist” was incomprehensible to her. Upon viewing classic graffiti movies such as “Style Wars” and “Wild Style,” Emi realized that anyone from any background could be an influential artist, and decided to start her art career in earnest at the age of 30. Originally from Hiratsuka City in the Kanagawa Prefecture, Luise mainly creates decorative and live paintings all over for the Tokyo club scene. She also creates murals for cafes and restaurants, and directs in-store displays for apparel brands. She also took part in the recent Shibuya Art Festival by having an exhibition inside of the “Aogaeru” train located in Hachiko square. She’s currently a part of the artist collective “trip art gallery”, which focuses on exhibiting energetic experiences by combining music, art, and spaces. Based mainly in Tokyo, YUSEI is artist that paints live mainly at clubs and events. Also a designer, he creates graphics for apparel and skate brands as well as for flyers for club events and parties. He is also an active member of the artist collective “Rinpa Eshidan,” creating corporate and commercial artwork for various companies. Carlos Gibbs of The Texture Group Shanghai will bring some original neon designs and banners to spice up the atmosphere at TnT Cafe.